“Well, no it doesn’t but bloody hell it should count for something! Not how many bloody twitter followers your centre forwards wife has got. It’s all wrong." "Hang on a moment Sir. Not 5 minutes ago you were saying that having big attendances like Chelsea and to a smaller scale Wigan, didn't mean they should be where they are"
“Oh no. We’ll do it Stubbs. We’ll do it. We have to do it. It’s the FA Cup. 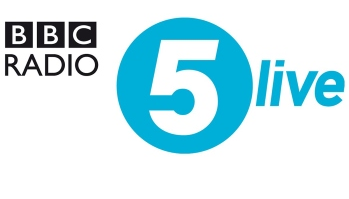 It’s the last bastion of what football should actually be about - Even though the BBC are trying to urbanise it by having Grime artists mumbling and heavy breathing while they show grainy shots of kids kicking a ball about infront of heavily graffitied shuttered shops on some sink estate in London – But ignore that, we have to look past that. I’m bothered Stubbs. Oh yes, I am bothered. I’m more bothered than I’ve been for a long time. We have to be bothered. We have to win this game. I mean, I don’t want to put pressure on our lads. But we have to win this bloody game. We have to win it for the good of the game. We have to win it to make some small ***** in redressing the balance of the football nature. We have to win this game Stubbs to restore some normalcy to the football world. We have to win this game for every long suffering fan of every none super-club who has stood in the pisssing rain watching a terrible football team week after week in a ruin of a ground . Not just Wednesday fans Stubbs, all fans of all the teams pushed out the road and crushed on the tidalwave of polish and glitter and marketing bullshite. 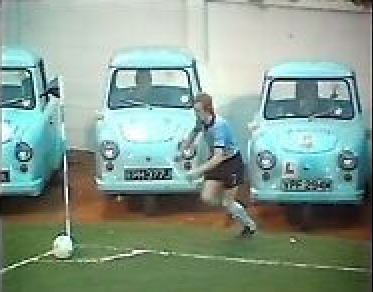 We have to win this game for every double-denimed bloke who ever walked out of his job and crammed himself as fifth man into a Reliant Robin and travelled 100 miles to see his team stave off relegation to the fourth division. 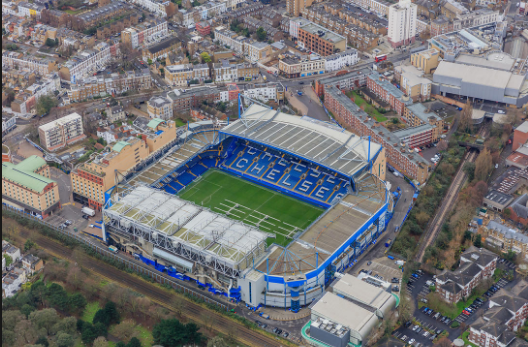 Wednesday travel to the Bridge hoping to overcome a pretty poor record FA Cup meetings between the two sides stack the offs highly in the London teams favour with Wednesday getting just two competition wins in that time. This is the 124th meeting in all competitions between Chelsea and Sheffield Wednesday but first since April 2000, a 1-0 win for the Owls at Hillsborough in the Premier League. 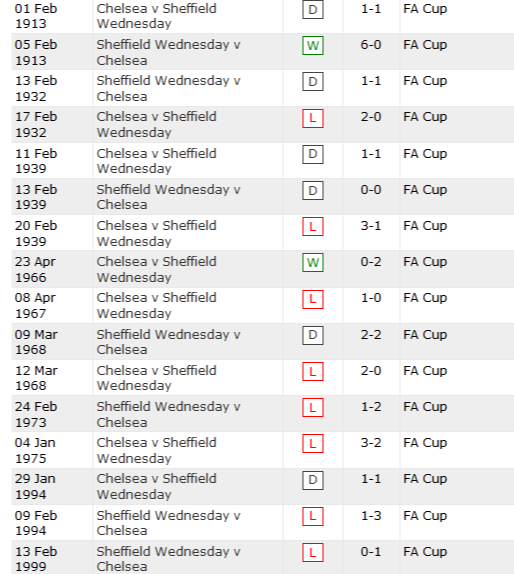 Sheffield Wednesday have been eliminated from eight of their 10 FA Cup ties with Chelsea, last knocking them out in the 1965-66 semi-final. Chelsea have progressed from 47 of their last 49 FA Cup ties against non-Premier League sides, losing in March 2008 against Barnsley and January 2015 against Bradford City. Sheffield Wednesday are facing the holders of the FA Cup for the first time since the 1955-56 campaign, when they lost 1-3 against Newcastle in the third round. Chelsea striker Olivier Giroud has had a hand in seven goals in his last four FA Cup appearances against sides from outside the top-flight (5 goals, 2 assists), scoring in each of his last four appearances, including one for Chelsea against Hull. The Bookies seem pretty convinced their second string will have too much for Wednesday too They're offering 12/1 for a Wednesday win. .....and there's talk that Gonzalo Higuain, one of the most dangerous hitmen in Europe might make his debut. so as you can see Sir. It doesn't look good. It doesn't look good at all. Sir? Sir are you ok?" "Bugger it all Stubbs , I'm fine. I still think we can win. I still believe in magic." Got a Reach screamer all over this one. Hutch has been giving the team talk all week. Let's give him and us a memory we deserve!!! Play with pride and passion, that is all. Come on Wednesday, let's get a win/draw. Roared on by and almost 6000 others. Then we'll bring them back to Hillsborough for to finish the job. Bringing great pleasure to with prize money and gate receipts from a packed Hillsborough for the replay. Nice rant Snoots! Really, really hoping for a good result and a fighting performance. Come on you blue and white wizards...sorry, anthracitic obsidian. Beers in, telly on and away we go. Best OMDT thread ever....fact. Spat me tea all over my computer screen reading the bit about boots, much to the annoyance of my boss. Couple more hours at work, then coach darn ta Lundon in the morning. To all those making the trip, have a safe journey. Fantastic observations of what our wonderful game has become since today’s opponents stepped upon gold and we stepped on something else. Hope we can put on a show tonight and make the world aware that the massive are awake, we’re a proper club with amazing history and unreal support. Alarm set early for me down in the colony. I've got a good feeling about tomorrow/today, not entirely sure why, but we can do this. the FA Cup as staying in the Prem was 'all that mattered'. Summing up the grim joyless reality of top flight football. It's all wrong, as you so eloquently ranted. Quality OMDT and I agree with the sentiment of it. I do wonder about all this bought and paid for glory in football these days and what it really means to the fans whose teams are involved in it. I wonder if winning the FA Cup last year had the same effect on a Chelsea fan as winning the lesser regarded League Cup in 91 had on me. Did it move you in ways you didn't even know you can be moved? Did it make you incredibly proud of your city, your club and everyone involved in it, your fellow supporters and yourself for being part of it all? I might be wrong but I don't think it did. Listen to those travelling fans when you take to the pitch today boys. That will be truly Premier league. And fight from start to finish, even if we fall miles behind. That will be truly Sheffield Wednesday. That's all I want to see. A cautious 3-0 to Wednesday is my prediction. That Eddie Howe reminds me of my lad and his clean cut mates...the boring shower that they all are. That is all I have to say other than..
COME ON WEDNESDAY LET'S DO THIS WAWAW UTODTB ! I've gone from the "ohfuckwe'regonnagetbattered" reaction to the draw, to now being reyt excited about going to an away match for the first time in ages. Even though we'll probably still get battered. That said, I've been to Chelsea 3 times before and never seen us concede a goal there so that's a good omen and as long as they don't significantly boost that average I'll be happy. 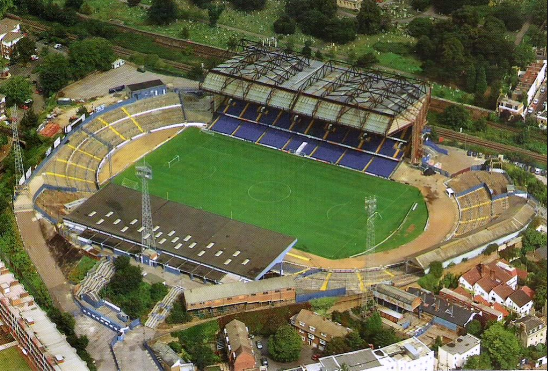 I'll be mentally comparing the ground to the good old days though, terraces a mile from the action, Shezza outclassing Vinny Jones, Andy Townsend and co on a mudbath of a pitch, and the distinct possibility of getting assaulted after the game. And it cost about £10 to get in. You see, these are the sort of match stats I prefer to hear!